 NO CUSTOMER REVIEWS? -POYANK LATEST UPGRADED VIDEO PROJECTOR JUST ARRIVED! - Say hello to our new upgraded home projector at LOWEST deal price 79.99 [24 Hours Time Limited]. Turn up your Summer! Enjoy your indoor and outdoor home entertainment movies or video games with your family. [Don't recommend to use it for PPT, text, excel or other presentations].  FAMILY HOME ENTERTAINMENT'S BEST CHOICE - POYANK portable projector works great with video games like PS3, PS4, WII, XBOX. It can also work with PCs, laptops, blue-ray DVD players, TV box, Amplifier, Amazon Fire TV Stick, Chromecast. You can use a lightning to HDMI adapter to connect our projector to your iPhone, iPad. For android smartphones, you need to use a wireless HDMI dongle to connect. 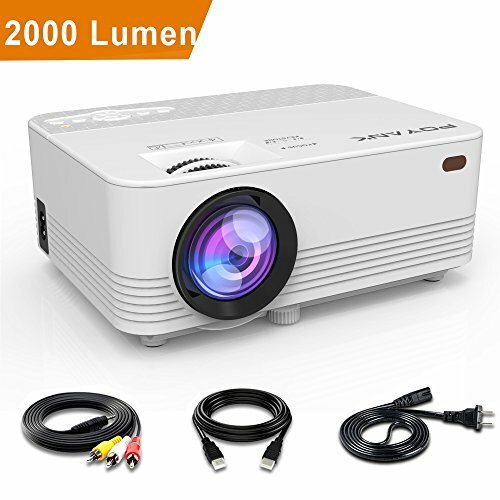  FULL HD LED PROJECTOR WITH HIGH RESOLUTION: It's native resolution is 800*480 and support resolution is up to 1920*1080. The contrast ratio is 2000:1. Aspect Ratio is 4:3/16:9. 480P, 720P, 1080P are all supported.  KNOWS MORE ABOUT POYANK PROJECTOR - POYANK LED Projector has HDMI, USB, TF, VGA, Audio in, 3.5mm Mini Jack, 2x Speaker 2W, 2x IR Receiver (Front + Rear) ports. The projection image size is 32"-170" at the distance of 1.2M-5M. And the lamp life? 50000 Hours! If you have any questions about this product by POYANK, contact us by completing and submitting the form below. If you are looking for a specif part number, please include it with your message.